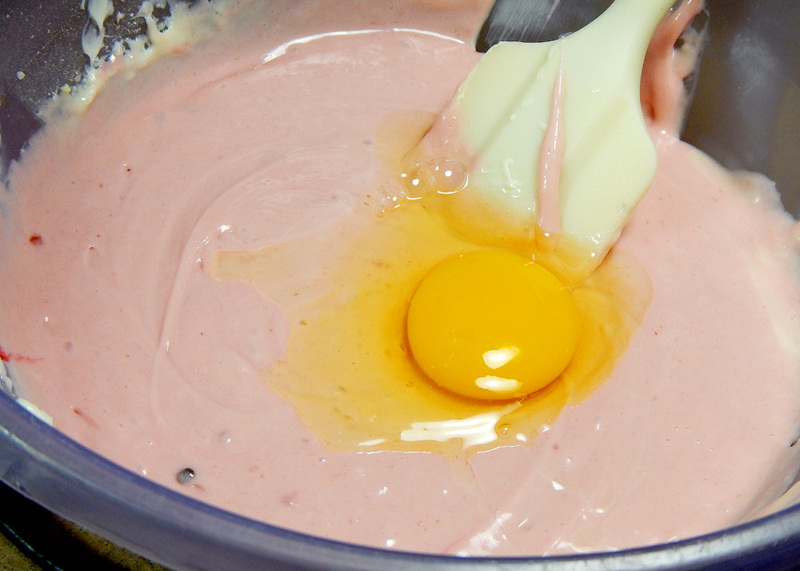 You can make less-fat cheesecake that still tastes good! I cannot believe I just typed that because low-fat desserts are not usually my thing. I’m a bring-on-the-butter type. But when I posted my Coconut Vanilla Greek Yogurt Cheesecakes many of you asked about lighter options. You inspired me to experiment. The final results surprised me and several unsuspecting taste testers. So here’s the secret…fat-free Greek yogurt. It adds flavor and richness without adding excessive calories. 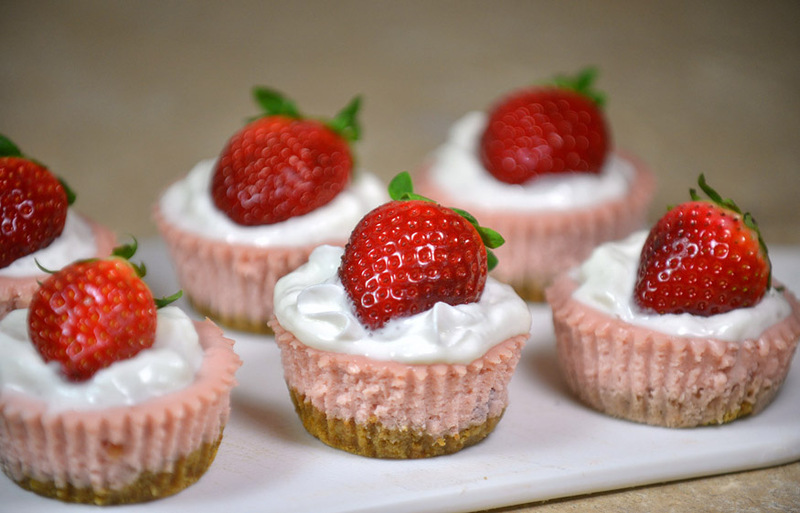 My mini cheesecakes usually include three packages of full-fat cream cheese. 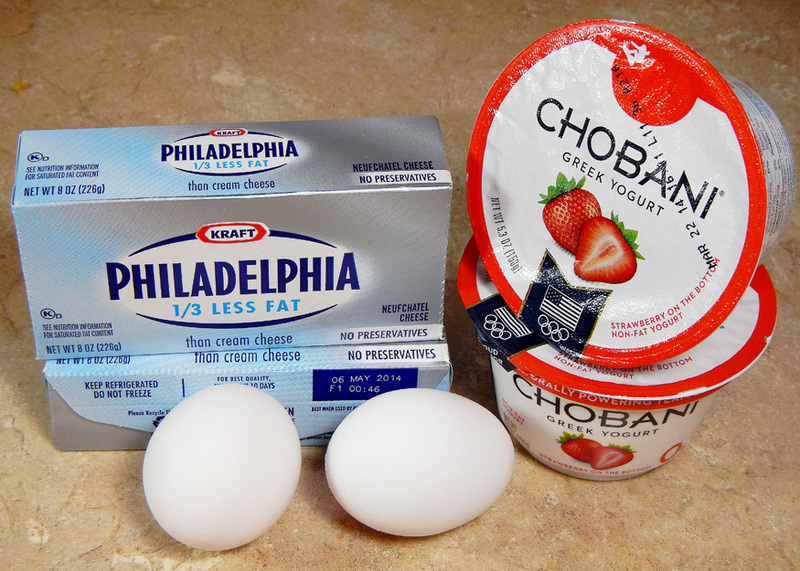 In this recipe I replaced two of the packages with 1/3 less-fat cream cheese. I replaced one of the packages with two containers of Greek yogurt. The changes cut about forty percent of the calories and nearly half the fat from the traditional recipe. As you can tell from the testers’ reactions, they taste so rich and creamy no one will know unless you tell them. 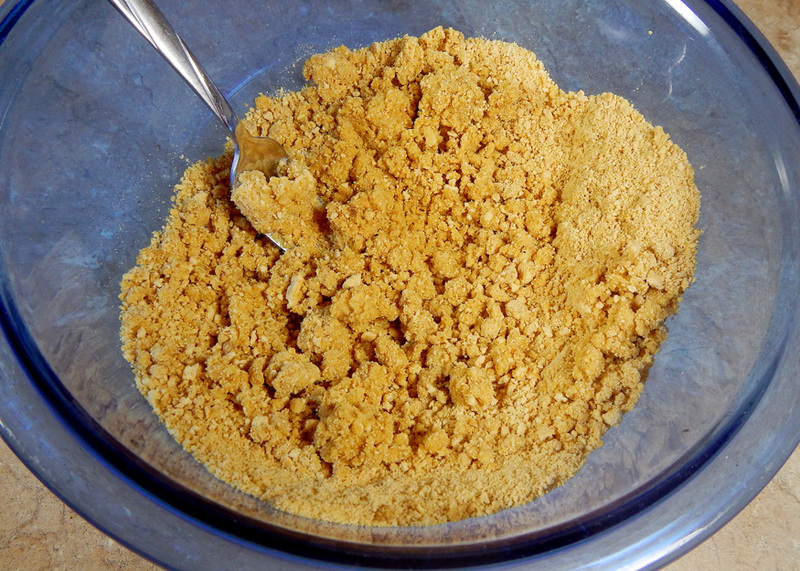 For the crust, mix graham cracker crumbs, sugar, and butter. I hear you out there saying, “Butter? In a less-fat recipe?” Yes, butter! I know it sounds crazy. I experimented with healthier options like egg whites but nothing had the right texture or that wonderful buttery flavor. Since it’s just half a stick, the butter adds 27 calories to each cake. 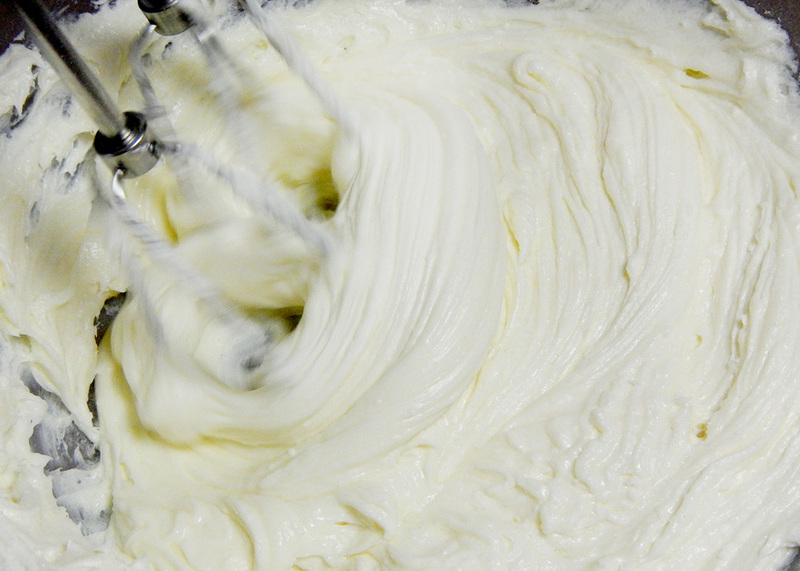 Beat the cream cheese with sugar, cornstarch and salt. 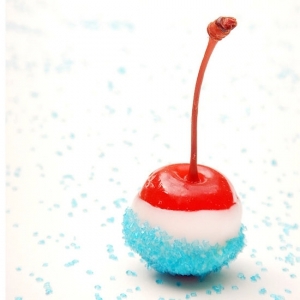 Mix in the jam, vanilla and food coloring. Then add the eggs one at a time. Scrape the bowl well between additions. Finally, stir in the yogurt. These look pretty topped with low fat whipped cream and strawberries. Some people have asked, “Since these are less-fat does that mean I can eat two?” I say dig in and enjoy! 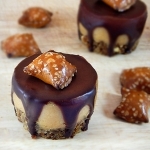 For more sweet recipes you can follow me on Facebook, Twitter, or Pinterest. If you want to be the first to get new recipes you can subscribe by email. 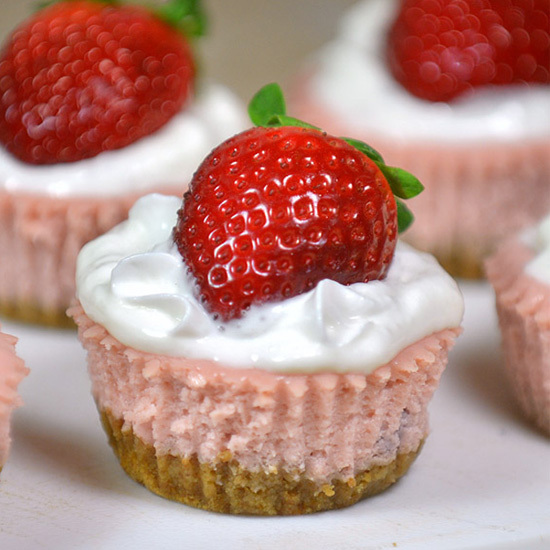 You won’t believe these cheesecakes have less fat than most. 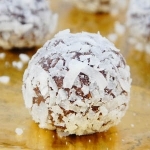 They are made with 1/3 less fat cream cheese and fat-free Greek Yogurt. Combine graham cracker crumbs, melted butter, and sugar. Press 1 tablespoon of the mixture into each liner. Cool in pans for one hour. Place in refrigerator. Chill at least four hours before serving. Top with light whipped cream and Strawberries. For best results use room temperature ingredients. Awesome pictures. These sound realy light and refreshing. I’d love it if you shared these at What’d You Do This Weekend. These are delicious! When I tried one I felt guilty eating what I thought to be a heavy dessert. But it turns out its LOW FAT.. and it was delicious! Thanks for giving me some laurie! Thank you for being a taste-tester, Elyse! I’m glad you liked them! I’m glad you liked them Lorynn! That’s a great idea, Angel! Thank you for sharing. Dose it work with sugar substitutes like Splenda for diabetics? Unfortunately, I’m not sure how substitutes would work because I haven’t tried them myself. Since the strawberry jam can have a lot of sugar, I’m don’t know if it is possible to make this sugar-free. If you do try them with a sugar-substitute or sugar-free jam please let me know how they turn out. 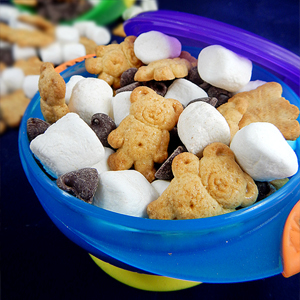 Thank you so much for sharing your twist on this recipe. I know a lot of readers will be glad to hear that combination works! I’m so happy you liked them! Thanks for letting everyone know how the alterations worked out. You have AMAZING photos and beyond amazing recipes. Can’t wait to try them. I am really glad I found you!! Thank you! I just stopped by your site and the first recipe I see is Almond Mocha Brownie Bars! W-O-W! I used Splenda n they taste awesome! Next tine I’ll use almond meal/flour instead of graham cracker. Thanks for this delicious recipe! I’m glad you liked them! Several people have told me Splenda worked well for them. I’m going to have to try it myself! Thanks for stopping by Get Inspired Link Party! Hope you’ll come back and see us again tomorrow. Thank you, Lauren! I definitely will. These will definitely last the two days in your fridge until the party. 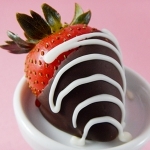 Put the whipped cream and strawberry on top just before you serve them. 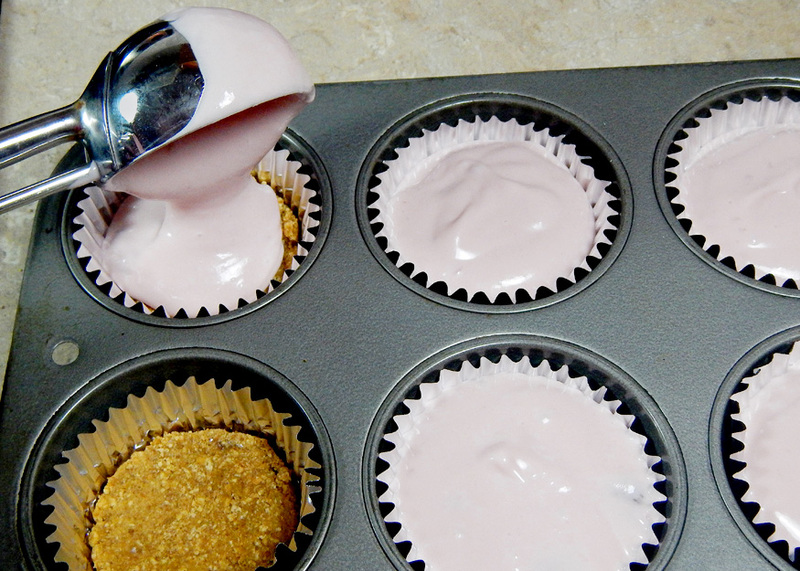 You can generally freeze cheesecakes without the fruit or cream on top for up to two weeks. Just wrap them tightly with plastic wrap and foil. I hope you have a great event! I’m English so I don’t use cups as my measurement! Would the recipe work with converted measurements I.e. Cups to grams? Thank you so much! I will definitely use this website for future baking and thanks for being so helpful! 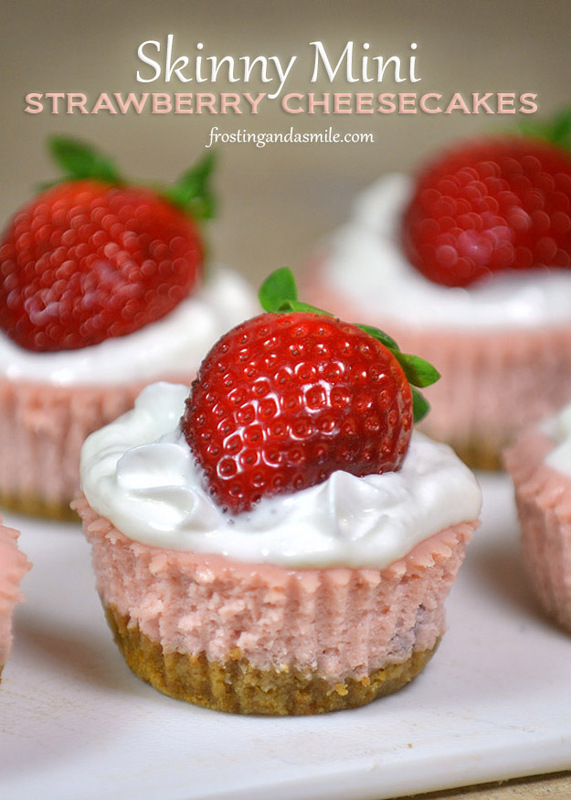 I have made these mini cheescakes 4 times now and everyone loves them. Thanks for sharing your recipes. I’m so happy you like them Marianne! Thank you for writing.